Posted by Maggy Parries on Aug 25th, 2016 and filed under Allgemein, Automotive, Breaking News, Featured. You can follow any responses to this entry through the RSS 2.0. Both comments and pings are currently closed. Lexus has a new millionaire with global sales of the IS range of sports saloons moving into seven figures at the end of July. It’s a big achievement for a car that was the first Lexus to be designed primarily for the European market, a region where its popularity remains strong today. In fact, one in five Lexus IS sold worldwide is sold in Europe. Seventeen years ago, Lexus’ intention was for the IS to attract new, younger customers to the brand; being a sporty, compact saloon offering sharp styling, a responsive straight-six 2.0-litre engine and rear-wheel drive. As the third Lexus to debut in Europe after the original LS and GS models, it succeeded in giving the company a presence in a large and highly competitive part of the premium car market, its outstanding driving dynamics and sporting profile matched by high equipment and safety levels. Lexus’s fast-growing reputation for excellent quality and customer service further helped the IS win customer interest, and the range soon expanded to include the more powerful 3.0-litre IS 300 and, from 2001, the novel SportCross compact wagon. Displaying more distinctive and sophisticated styling rooted in Lexus’s new L-finesse design philosophy and even more refinement, the newcomer provided the platform for Lexus to explore new possibilities that would see the IS develop much wider market appeal. The initial IS 250, featuring a 2.5-litre V6 petrol engine and available with a new automatic transmission, was joined in 2006 by the first diesel-powered Lexus, the IS 220d. A year later, the Detroit Motor Show witnessed the unveiling of the IS F, a high-performance saloon “built by enthusiasts, for enthusiasts,” as Lexus declared. This was the first Lexus to wear the F performance badge, a predecessor of the LFA supercar and today’s RC F and GS F models. Every part of the car was honed for performance and driving pleasure. Its 5.0-litre V8 engine delivered 423 DIN hp through the world’s first eight-speed transmissions, enabling the car to move from rest to 100 km/h in just 4.8 seconds, en route to a 270 km/h top speed. The IS F was genuinely race track-bred, with extensive testing at the Fuji Speedway in Japan and on Germany’s renowned Nürburgring. As a thoroughbred, it was engineered with dedicated performance components, from its engine, transmission and suspension to its wheels and tyres. The versatility of the IS was further explored in 2009 with the introduction of the IS 250C, a svelte coupe-convertible equipped with a three-part retracting hard-top. Not only was the roof mechanism the fastest-operating on the market, its ingenious design ensured the IS C looked equally good with top up or down, and allowed for generous space for rear seat occupants. The current, third generation IS marked the beginning of a new era for the model with the introduction of Lexus Hybrid Drive to the range for the first time. Since the model’s launch in 2013, the IS 300h has proved by far the most popular choice for European customers, claiming 90 per cent of IS sales. The full hybrid model delivers exceptional smoothness and efficiency while preserving the driver rewards that have traditionally been part of the IS’s special appeal. The powertrain combines a 2.5-litre, four-cylinder Atkinson cycle petrol engine with a compact, powerful electric motor for smooth and responsive performance, supported by the use of Dual VVT-i intelligent variable valve timing, Lexus’s D-4S fuel injection technology and a high-efficiency exhaust gas recirculation system. The advanced engineering delivers unprecedented low exhaust emissions and fuel economy for the IS, with official performance figures from 97 g/km of CO2 and 4.3 l/100km, strengthening the model’s attractiveness in a market where environmental performance and ownership costs are key customer considerations. The IS also offers a 2.0-litre turbo engine with innovative D-4ST fuel injection technology for both fuel economy and instantaneous torque. 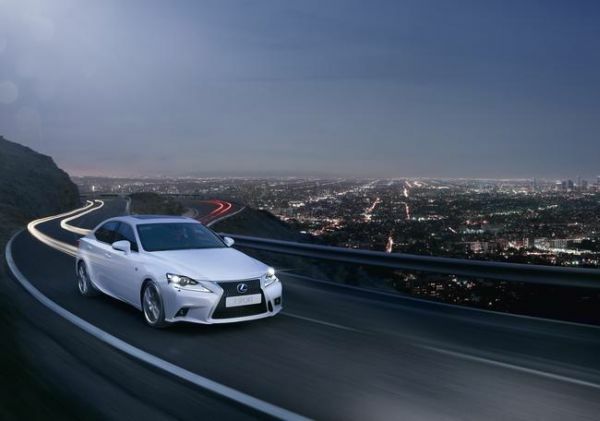 The Lexus IS 200t delivers 245 DIN hp with a maximum torque of 350 Nm. Capable of rapid acceleration up to a top speed of 230 km/h, its eight speed Sport Direct Shift transmission was developed for the high-performance RC F.
The IS continues to be a core part of Lexus’s worldwide model range, currently marketed in more than 70 countries and achieving sales of more than 6,000 units every month.